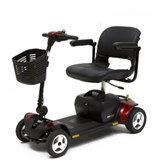 Pride mobility is a major manufacturer of Wheelchairs, Scooters and other mobility products. Their Go-Go line of scooters are all travel/portable scooters designed for people who are looking for a small lightweight scooter that can be easily loaded into vehicles for destination use such as malls, parks, medical buildings, social gatherings and more. The Go-Go line of scooters are not suitable for rough terrain, long distance travel, use in poor weather or as a primary mode of transportation. The Go-Go-scooters were not designed for these purposes and those looking for scooter for these uses would be better served to look at other larger models of scooters. The Go-Go family consists of 7 models of scooters. These seven product models are intended to give users the opportunity to choose a mobility device that most closely meets their needs within the portable scooter group. Because there are so many scooters in this group I'm going to just give the highlights for each. 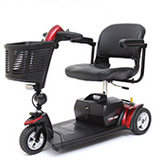 For more information you can contact your dealer or visit the Pride Mobility website. 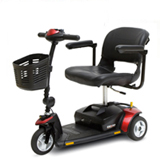 The Go-go Traveller is available in a three wheeled and four wheeled versions and is especially well suited use in small areas. 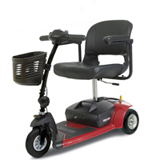 The three wheeled version will be the best option for areas where tight maneuvering is needed. The Go-go Traveller Plus is basically the same as the standard Traveller but has the larger batteries as standard features and has a higher ground clearance. Again, the three wheeled version will be the best option for areas where tight maneuvering is needed. 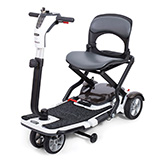 The Go-go Ultra X Mobility Scooter is basically the same as the standard Traveller but has a lower weight capacity and the shroud has a different look. 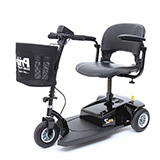 For those under 260 pounds either scooter is an option but for those over 300 pounds the Traveller is the better choice. Again, the three wheeled version will be the best option for areas where tight maneuvering is needed. 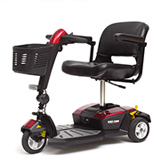 The Go-go Sport Mobility Scooter is their "high performance model" with a higher weight capacity and the larger 18 a/h batteries for fairly good range on a charge. Again, the three wheeled version will be the best option for areas where tight maneuvering is needed. The Go-go LX Mobility Scooter is similar to the Traveller Plus but offers a choice of batteries and is the only Go-Go scooter to feature suspension for a softer ride on bumpy surfaces. Again, the three wheeled version will be the best option for areas where tight maneuvering is needed. The Go-go ES 2 Mobility Scooter is lowest priced and most basic of the Go-Go Scooters. It has a basic high/low two speed control and the smallest batteries of the group. It is only available in the three wheeled configuration but comes in any colour you want as long as the colour you want is black. The Go-go Folding Mobility Scooter is the only scooter in this group that will fold for transportation and storage. This model also offers an optional lithium battery for those who'd like to have more range on a charge. The warranty for the Go-Go scooters varies between models. Batteries: The batteries are covered by a separate six (6) month warranty, provided by the battery manufacturer. Warranty Exclusions: This warranty does not extend to those items which may require replacement due to normal wear and tear.